An international airport was in the midst of an expansion project. As part of the project, 24-inch-diameter jet fuel piping was being installed by a subcontractor hired by the general contractor that was directly hired by the owner to manage the project. The piping manufacturer installed both the interior and exterior linings. According to the specification, the interior of the pipes was required to be abrasive blast-cleaned to an SSPC-SP 10/NACE No. 2 Near-White Blast Cleaning finish. Additionally, according to the specification, “The standard required at the time of lining shall be a minimum of ISO 8501-1 grade Sa 2 1/2, with a surface profile of 70 ± 20 microns peak-to-trough height. The coating system specified for application to the interior of the piping system was a phenolic lining. According to the product data sheet, the lining material was an amine-cured, modified epoxy-phenolic. The primer’s solids content was approximately 65 percent by volume and the finish coat’s solids content was approximately 63 percent. Both coats had a recommended dry film thickness of 100-to-150 microns per coat. The specification required that the coating be applied in two coats at a dry film thickness of 125 microns per coat. The first 50 mm of the ends of the pipes were required to be left bare. The pipes were manufactured by a different company than the contracted company that was responsible for abrasive blast-cleaning and coating. After application of the interior coating, the pipes were transferred to a protected curing area. The interior of the curing area was heated with portable heaters. The pipes were delivered to the jobsite at the airport in three lots, referred to as Lot 1, Lot 2 and Lot 3. During installation of the pipes, no additional preparation or coating was required to be performed at the welded seams. Sometime after the pipes were shipped to the jobsite, a number of the pipes in Lot 2 had been placed in trenches and were exposed to flooding conditions that partially or fully exposed the pipes to muddy water. Most of the pipes that were exposed to the floodwater were subsequently cleaned with fresh water to remove sand and other contaminants. After the pipes had been exposed to the water, a video survey was performed to determine the condition of the interior coatings and to determine whether contaminants had been removed. It was discovered that the coating had blistered and delaminated in several areas. The delamination was most prevalent at the first several centimeters of the coating at the edges of the pipes. A consultant visited the expansion project at the airport approximately 11 months after the coatings were applied. The consultant was accompanied by the facility management representatives and the pipe installation organization. The results of the field investigation, in summary, are as follows. Some of the pipe that had been installed and was subject to the flooding was subsequently removed and transported to a laydown yard close to the site office. The pieces of pipe that were examined during the field visit are listed in Table 1. Table 1: Pieces of Pipe Examined During Field Visit. The interior of the 24-inch-diameter pipe sections were coated with a light gray lining. The lining appeared to have been applied in a smooth and consistent manner and there was a minimum of noticeable visible application defects such as runs, sags and missed areas. Several of the pipes from Lot 2 were examined. The pipes were reportedly flame-cut when they were removed, which in many cases caused visible damage to the coating near the edges, including some visible charring. As a result, the coating was not sampled in these areas since there was no assurance that any visible coating damage was not caused during the removal process. There were two major concerns with the interior lining. The first concern was the prevalence of rust staining. In several of the pipes that had been flooded and subsequently flushed with water, there was a pattern of pinpoint rusting that was prevalent, typically on one side of the pipe. 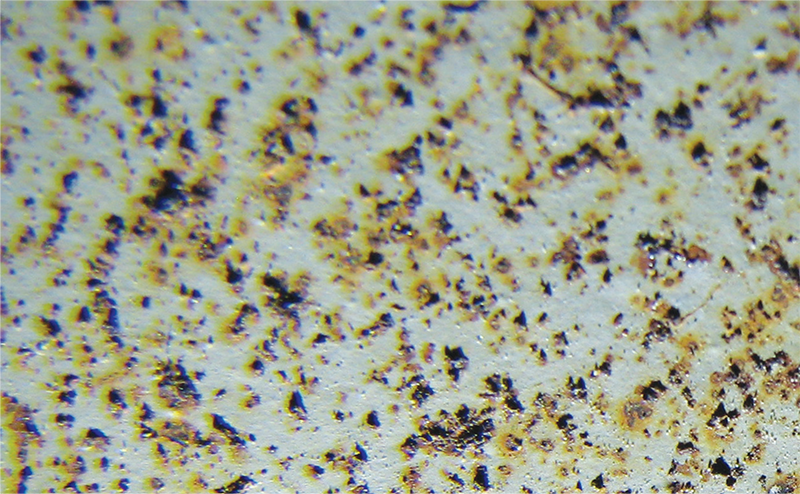 The areas of pinpoint rusting were closely examined using a field microscope and it was clear that the rusting was the result of deposits of metal on the surface of the lining. The rust staining did not penetrate through the topcoat, and there was no noticeable associated rust staining on the surface of the pipe when the coating was removed. Typically, small particles of metal were visible on the surface of the lining, and rust stains were visible surrounding the metal particles. 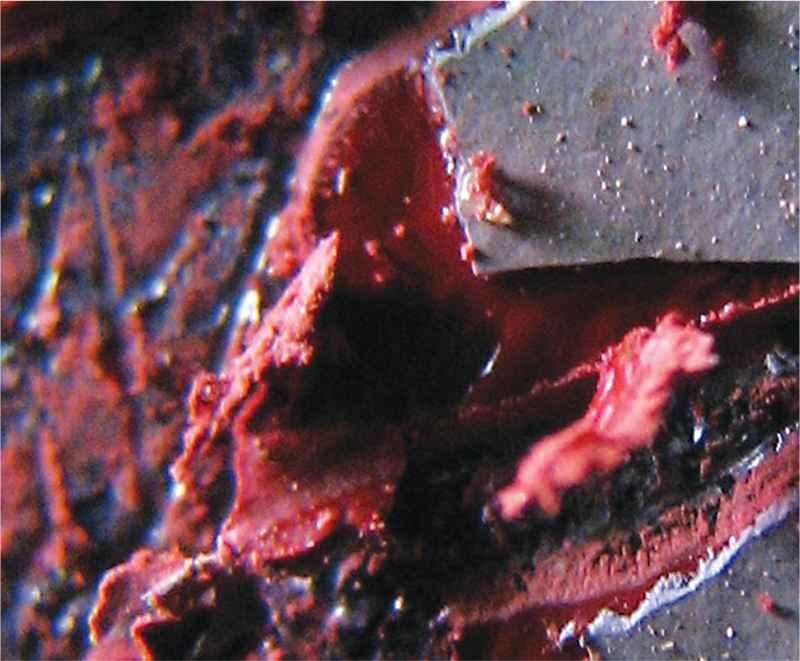 The metal particles could be removed by scraping the surface with a knife. 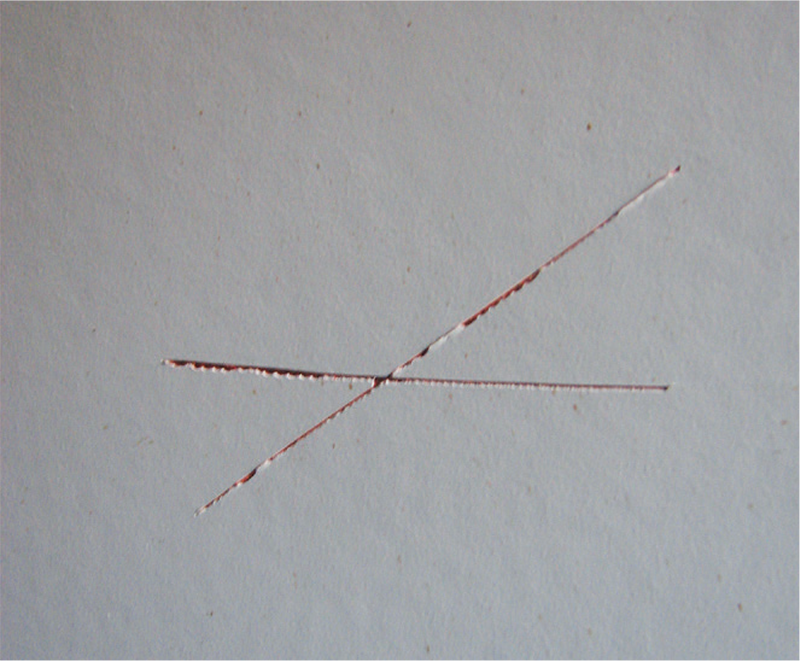 Fig 1: Rust staining on the surface of the lining. The second concern was the occurrence of blistering and coating delamination of the interior lining. Blisters in the coating were found in several of the Lot 2 pipes. In all cases, the blisters occurred between the topcoat and the primer. No blistering or delamination of the primer from the substrate was found. The blisters ranged in size from 1/4-inch in diameter up to approximately 3 inches in diameter. When blister caps were removed, an amber colored translucent viscous liquid was found on the surface of the primer. The blister liquid had a slight unidentifiable odor. In some cases, when the blister was pulled away from the surface, the clear viscous liquid formed a string between the surface and the blister cap. On two of the pipes that were examined, blistering was prevalent along the longitudinal weld. Typically, the blistering occurred at the boundary between the weld and the surrounding pipe surface. When the blister caps were broken in this area, the translucent viscous liquid was present on the surface of the red primer. On the Lot 2 pipes that experienced blistering, there was also an unusual surface deformity on the topcoat, which was present on approximately one half of the circumference of the pipe, but extended much of the length of the pipe. The deformity was present as a pattern of furrows or valleys and the surface had the appearance of mud cracking, although there was no actual crack in the topcoat. 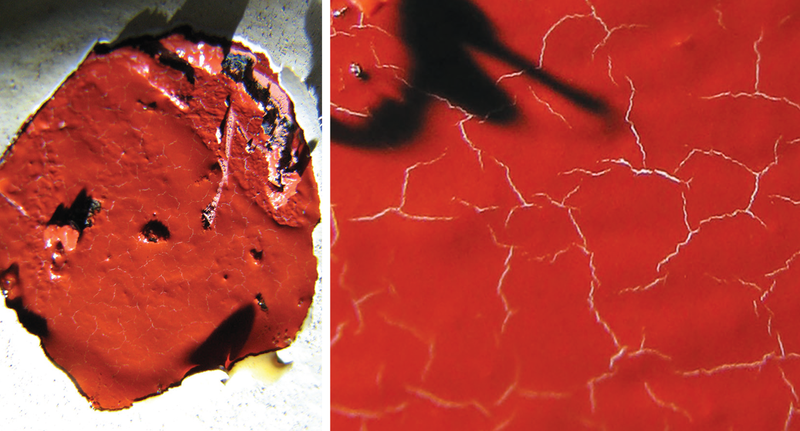 When blisters were removed, there was often a similar mud cracking pattern on the red primer, although that pattern appeared to be the result of deposits of the gray primer on the surface of the red primer that matched the pattern of the furrows on the topcoat surface. One of the pipe sections from Lot 2 had been in contact with floodwater on approximately half of the circumference of the entire pipe, but had not been flushed. Dirt was present on approximately half of the circumference, but the other half was clean and similar in appearance to the new pipes. The unusual topcoat surface deformity appeared on half of the circumference of another pipe from the same lot, but the half with the surface deformity did not align with the half that had been flooded. There was some overlap, but there were areas that had been flooded that did not exhibit the surface deformity, and areas that exhibited the service deformity that had not been exposed to floodwater. The adhesion of the coating was assessed in accordance with ASTM D-3359, Method A, “Measuring Adhesion by Tape Test.” This method involves making two intersecting cuts through the coating to the substrate with a sharp blade. The smaller angle of the cuts is between 30 and 45 degrees F. A special pressure sensitive tape is then applied to the X-cut area and rapidly removed. The adhesion of the coating is rated according to the amount of coating removed by the tape using the following ASTM scale. 5A – No peeling or removal. 4A – Trace peeling or removal along incisions. 3A – Jagged removal along incisions up to 1/16 inch on either side. 2A – Jagged removal along most of incisions up to 1/8 inch on either side. 1A – Removal from most of the area of the X under the tape. 0A – Removal beyond the area of the X. Generally, the adhesion of the coating was found to be good (3A to 5A) even in areas immediately surrounding the blisters. When the coating was picked and probed with a utility knife, it was found that the topcoat could be separated from the primer, although in very small chips, in areas generally on the same half of the pipe as blisters and in areas where the topcoat surface cracking pattern was present. In areas where cracking was not present and on new pipes from Lot 1 and Lot 3, the topcoat could not be separated from the primer. The dry film thickness of the coating was measured on all the pipe sections that were examined using a calibrated electronic dry film thickness gage. The dry film thickness of the coating varied from 7.6 mils (193 microns) to 13.0 mils (330 microns) and was generally close to the specified coating thickness. There was no noticeable correlation between the thickness of the coating and the occurrence of coating delamination, blistering, or the unusual surface deformity. Fig. 2 (left): An exudate is visible on the surface of the primer. Fig. 3 (right): Cracking pattern on primer consisting of traces of the gray topcoat. The field investigation and the laboratory analysis revealed the cause of the blistering and delamination of the epoxy phenolic pipe lining system to be the presence of an exudate on the on the surface of the primer. The exudate was an amber-colored, translucent viscous liquid that was clearly visible on the surface of the primer when blister caps were removed from pipes during the field visit. The blistering and delamination of the coating always occurred between the topcoat and the primer. Fig. 4: Good adhesion of the coating on Lot 1 pipe. Laboratory infrared analysis indicated that the exudate was mostly organic material consisting of epoxy and unreacted amine. The composition of the exudate is similar to the composition of the resin materials that are present both in the primer and in the epoxy phenolic topcoat. Because the exudate was present between the primer and the topcoat, it is believed that it originated in the primer and was present on the surface of the primer when the topcoat was applied. Had the exudate originated in the topcoat, it would simply have appeared on the surface of the topcoat and would not have created blistering or delamination problems. 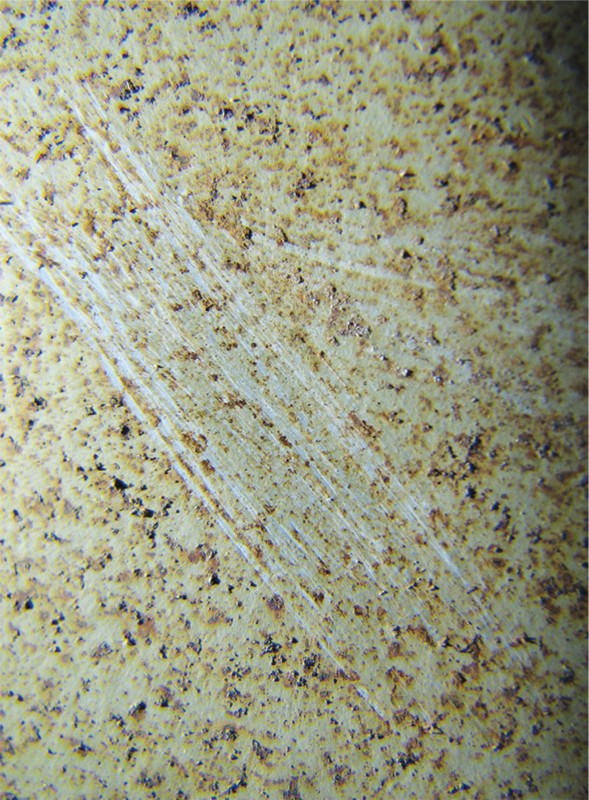 Along with the blistering and delamination of the topcoat from the primer, there was also the unusual visible pattern on the surface of the epoxy topcoat consisting of furrows or valleys, which resembled something similar to a mud cracking pattern even though the topcoat did not actually crack, but instead formed connected valleys in the coating. The pattern that was formed is most likely a result of the exudate present on the surface of the primer, which was soft, while the topcoat developed considerable hardness and shrinkage stress during the curing process. It is clear that the topcoat shrank during the curing process and while the topcoat was still a semi-liquid, it stretched in certain areas to relieve the shrinkage stress. The areas that stretched were the valleys in the unusual mud cracking pattern. Typically, when a coating develops shrinking stress during the curing process, the coating is unable to move because the underlying surface is hard, and the coating is attached to the surface. In this case, the soft exudate allowed the topcoat to slide over the surface during the curing and shrinking process, eventually leading to the unusual mud cracking pattern. The flooding of the pipes did not create the delamination or blistering problem, but instead revealed a problem that already existed. The laboratory analysis determined that the exudate was water-soluble or at least partially water-soluble. When water was introduced into the pipes, some of the water transferred through the topcoat to the water-soluble exudate in a process known as osmosis, which mostly occurs in a coating system when a water-soluble material is present beneath a coating. The unusual cracking pattern on the surface of the topcoat was created during the initial curing process. Once the topcoat has cured and hardened, the coating can no longer be deformed to create the valleys that were present in the topcoat. These valleys can only be created while the coating is still in a semi-liquid state. Once a coating has hardened, the curing stresses are relieved only by cracking of the coating, not by stretching or deforming of the coating. Further evidence of the formation of the unusual surface pattern independent of the flooding was found in one of the Lot 2 pipes. It was clear from the deposits on the surface of the pipe that approximately half the circumference of the pipe had been flooded, but the variability of the cracking pattern on flooded and unflooded areas of the pipe is an additional indication that the cracking pattern was not a result of the flooding. A video examination of the installed piping system indicated that the coatings were often cracking and delaminating near the circumferential welds. It appeared that often the first 5 or 6 cetimeters of coating at the edges cracked, and the cracking and delamination occurred on approximately half of the circumference of the pipe. The video did not have sufficient resolution to determine whether or not the mud cracking pattern was present on the intact coating near the areas of cracking and delamination at the pipe edges. If cracking delamination had been present on the edges of the pipes that were removed for examination, these areas were damaged by the heat of the removal process and no appropriate sample areas exhibiting the edge delamination were found. Fig. 5: Cracking pattern on topcoat and primer. It is likely that the cracking and delamination at the edges was also a result of the exudate. Similar to the blistering and the unusual surface pattern, the delamination at the edges occurred between the primer and the topcoat and was found on half the circumference of the pipe. It is most probable that the heat generated during the welding process softened or melted the exudate to the point where the topcoat cracking released. Because the exudate appeared to be composed mostly of uncured resin, it is reasonable to expect that heat would lower the viscosity of the material. The properly cured epoxy phenolic coating system should not have been adversely affected by the welding process to the degree found in the inspection videos. Typically, if weld heat does affect the lining, the failure mechanisms are blistering from the steel substrate, and not between coats. The reason for the formation of the exudate could not be definitively determined, but most likely the primer surface was exposed to moisture before the epoxy phenolic resin and the amine hardener had reacted. Sometime before the resin and cross-linker adequately reacted, the coating was exposed to moisture. When the moisture evaporated from the coating, it transferred the partially water-soluble material to the surface. This material was not volatile, and it remained on the surface when the water evaporated. The source of the moisture could not be determined because the exposure occurred during painting operations and the conditions were consequently not directly observed for the investigation. Photographs taken during painting operations indicated that the pipes were transported to a heated building after coating to facilitate curing. It appeared that the heat was supplied by direct-fired kerosene heaters. Direct-fired fossil fuel heaters should typically be avoided when providing heat for curing of coatings in enclosed areas, as they emit carbon dioxide and water vapor and in some cases can create moisture condensation problems, especially if the substrate is cold. The use of these heaters may have contributed to the formation of the exudate on the surface. Regardless of the exact source of the moisture, it was clear that the exudate formed on the surface of the primer before application of the topcoat, and the detrimental environmental conditions that precipitated the formation of the exudate occurred during the painting process. Fig. 6: Rust staining could be scraped away with a knife. During the field investigation, pipes from Lots 1 and 3 were closely examined. There was no sign of blistering and delamination, and the unusual surface pattern was not present in these pipes. Additionally, the adhesion of the coating in these pipes was excellent and there was no noticeable separation of the topcoat from the primer. There was no evidence that the problem with the exudate that was found in Lot 2 was present in Lot 1 or Lot 3. It was reported that sections of the pipe will be flushed with jet fuel at a flow rate several times higher than would be expected during normal operation. The effect of the jet fuel on the problematic pipe sections from Lot 2 was unknown. The introduction of jet fuel into these pipes in conjunction with the higher flow rate should be a good test to determine whether the jet fuel will dislodge additional sections of coating. It is anticipated that coating that can be dislodged by the jet fuel will be dislodged during this flushing process and that coating that is intact after the process should substantially remain intact during operation, although the magnitude of the coating delamination during the jet fuel flush should be considered. Rusting that was found on the surface of the pipes was a result of metal shavings that had deposited on the surface of the lining. The rusting did not penetrate through the coating system to the surface. The particles could be relatively easily removed by scraping the surface with a knife. The rust staining will not detrimentally affect the performance of the lining system. Rick Huntley is the manager of consulting services and a senior coatings consultant for KTA-Tator, Inc., where he has been employed for over 20 years. He is a NACE-certified Coating Inspector (Level 3) and an SSPC-certified Protective Coatings Specialist. Huntley has consulted on major marine coating projects, bridge coating projects, condominium and housing project rehabilitations and parking garage renovations. He has also conducted coating specification review for highway departments, water districts, A&E firms, and various manufacturers. Huntley is a primary instructor for various KTA training courses and holds a B.S. in chemical engineering from Washington State University. Cynthia O’Malley is the vice president and group manager of the professional services business unit at KTA-Tator, Inc., and co-chair of SSPC’s Women in Coatings Program. During her more than 20 years with KTA, she has been active in several industry organizations. 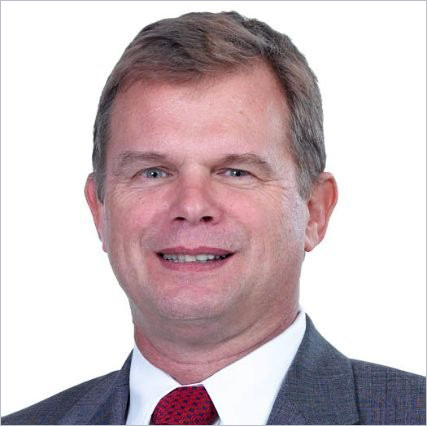 O’Malley is an SSPC-certified Protective Coatings Specialist, a member of ASTM International and past-president of the Pittsburgh Society for Coatings Technology (PSCT). Her industry honors include SSPC’s 2013 Presidents’ Lecture Series Award and 2015 Women in Coatings Impact Award.